I'm going to let you in on a not-so-secret secret: I don't like flavored chips normally. I certainly don't like Ranch or BBQ flavored chips usually. So when I had the opportunity to try out Green Giant™ Roasted Veggie Tortilla Chip - Garden Ranch and Green Giant Multigrain Sweet Potato Chip - Barbecue, I was skeptical at best. But the new Green Giant Ranch Flavored Tortilla Chips are super tasty! So tasty in fact, that I may have eaten nearly an entire bag by myself. Of course, that was done purely for thorough testing purposes so that I could give you a proper review. Anyone buying that? I didn't think so. Okay, so maybe Engineer helped me out with the taste testing a little...after I twisted his arm. Not buying that either are you? I tried the sweet potato chips as well and although they were not an assault on my taste buds like most BBQ flavored chips, they were not my favorite. They weren't bad, I just preferred the tortilla chips. On the flipside, Engineer likes BBQ flavored chips but isn't a fan of sweet potatoes, yet he thought they were really good. For both varieties, I wouldn't mind have their seasonings put in a bottle to use on baked potatoes. I hear you saying, "Pary, are they called veggie snacks because they are made with real vegetables? And can I replace one of my five a day with these chips?" The answers are yes and no. These snack chips are flavored with dried vegetables along with other spices; however, they are not a replacement for veggies. Sorry. Let's focus on the positive though shall we? Did I mention that they are really tasty? This may come as a shock but we aren't worried about the healthiness of our chips. Chips are inherently not the healthiest food choice and we are okay with that sometimes. There is a obviously a balance to be had. Green Giant's Garden Ranch Tortilla chips will definitely be purchased again. The fact that they may be a little healthier choice than regular chips is a bonus. 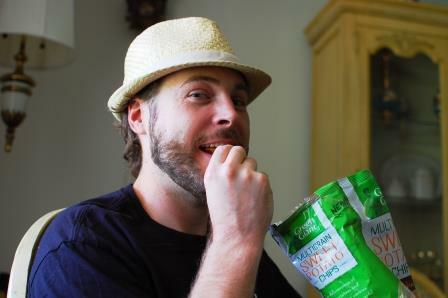 Have you tried Green Giant Veggie Snack Chips yet? *Update - It was Engineer's turn to provide food for his monthly Trivial Pursuit game with the guys last night. Along with other culinary delights, I thought it might be neat to send him with the Green Giant chips too for a wider test panel. They all liked the chips and gave them a solid "A." One of the guys is not a sweet potato fan and still liked the BBQ sweet potato chips. As a result of this larger group of subjects, no chips made it home.